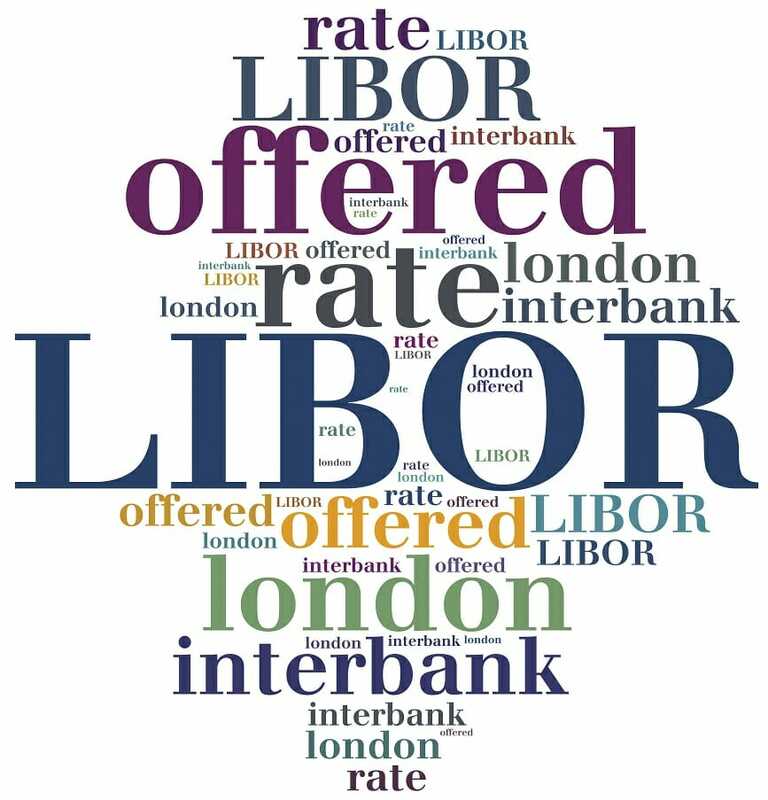 LIBOR, which is an acronym of London Interbank Offer Rate, refers to the interest rateInterest RateAn interest rate refers to the amount charged by a lender to a borrower for any form of debt given, generally expressed as a percentage of the principal. The asset borrowed can be in the form of cash, large assets such as vehicle or building, or just consumer goods. that banks charge other financial institutions for a short-term loan maturing from a day to 12 months. LIBOR acts as a benchmarking base for a short-term interest rate for the interest prices of securities like currency swapsUSD/CAD Currency CrossThe USD/CAD currency pair represents the quoted rate for exchanging US to CAD, or, how many Canadian dollars one receives per US dollar. For example, a USD/CAD rate of 1.25 means 1 US dollar is equivalent to 1.25 Canadian dollars. The USD/CAD exchange rate is affected by economic and political forces on both, interest rate swapsInterest Rate SwapAn interest rate swap is a type of a derivative contract through which two counterparties agree to exchange one stream of future interest payments for another, based on a specified principal amount. In most cases, interest rate swaps include the exchange of a fixed interest rate for a floating rate., or mortgages. The London Interbank Offer Rate is an important measure in assessing the health of different financial systems. When the rate is weak, the economy is underperforming and the opposite is also true. As a result, it is commonly used by various central banksFederal Reserve (the Fed)The Federal Reserve, more commonly referred to The Fed, is the central bank of the United States of America and is hence the supreme financial authority behind the world’s largest free market economy. as a reference in crafting policies affecting interest rates. ICE LIBOR: Is it similar to LIBOR? In the earlier days, before the great scandal of 2008-2012, the London Interbank Offer Rate was known as BBA LIBOR – British Bankers Association (BBA). Around this period, the BBA brought a downright shame upon itself and the financial markets by getting dirty through rates manipulation. Therefore, to eliminate the bad memories and bring in fresh insights to a bad reputation, it was renamed ICE LIBOR – Intercontinental Exchange (ICE). Thus, ICE LIBOR is the same as LIBOR. LIBOR rates are mere benchmarks instead of tradable rates. Therefore, throughout the day, banks may trade at different rates than the one listed early in the morning, usually at 11:00 (London Time). The maturity period of these rates may vary from a single day to a stretch of 12 months. 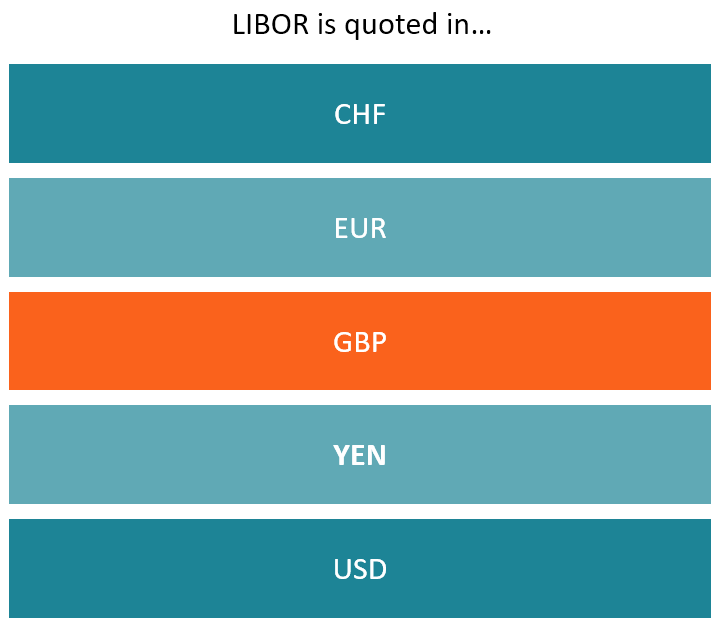 Overall, LIBOR comprises seven maturities, quoted for deposit of each of the five currencies – CHF (Swiss Franc), EUR (Euro), GBP (Pound Sterling), JPY (Japanese Yen) and USD (US Dollar). To produce 35 rates on every business day, the ICE Benchmark committee maintains an administration panel of between 11 to 16 banks contributors. The process of setting desirable interest rates begins by asking the panel the rate which they are willing to lend to other financial institutions. Usually, it occurs earlier in the day before the official hours of publishing the benchmarked rate. After they provide their desired rates, the contributions are listed in top-down order. Then, what follows is the elimination of outliers, which involves removal of 25% in the higher and lower contributions. Once they eliminate the outliers, the remaining rates are averaged and rounded to five decimal places. The process generally, is repeated across the five currencies for each maturity to produce a total of 35 LIBORs. Instead of basing the base denominator on a single currency like USD – which risks over-dependency on a single currency – the LIBOR base currency is in Eurodollar. As a result, it is watched closely by not only banks and financial institution but also private institutions and individuals. Below are the key benefits of watching the LIBOR rates. As stated earlier, instead of over-dependence on a single currency like USD, the interbank rate depends on the “euro-dollar,” which is a collection of five currencies each quoted in seven maturities. As a result, it cushions against risk related to dependency on a single currency. The London Interbank Offer Rate provides a stable pool of 35 rates calculated daily under a monitored environment. As a result, if in any case there will be fluctuations in the rates, it will not be tied to a single market but on the global market. Also, other investors across the globe may cushion against the fall of the market by reacting to rising rates. Therefore, despite past controversies behind the LIBOR, it’s important to acknowledge its intentions in bringing stability in lending rates and the financial market are pure. A general LIBOR rule prescribes that during difficult economic times, a large pool of investors investing in mutual regard will lead to lower interest rates, and therefore a healthy trading environment. Meaning, conservative investors will opt in LIBOR to create a safe-haven investment to reduce their investment risks. The Eurodollar market is traded daily due to its popularity. Even better, it’s traded across the globe. As a result, there are no government regulations. It’s operations solely lies in the decisions of the investors themselves and the current state of the market. In early 2014, the ICE took the oversight function from the BBA and started working to restore the glory of the LIBOR. One noticeable change it did to clean up the problem is to change the way it calculates the interbank rate. Earlier along, BBA calculated its interest estimates from 200-odd-members banks. Unfortunately, to make the trade look lucrative and favor some few individuals, the numbers rates was manipulated under the watch of the then BBA chairman. Therefore, to clean these sins of trade, ICE now calculates its LIBOR from respected references banks, which number less than 20. The activities are under the watch of a robust governing committee of IBA that embodies honesty. The committee comprises of benchmark submitters, independent non-executive directors, benchmark users and other relevant experts like a highly savvy financial analyst. Therefore, LIBOR, under the watch of ICE, is safer than it used to be prior to 2014. In July 2017, the FCA expressed its dissatisfaction by declaring that USD LIBOR is unsustainable and undesirable due to lack of active markets to base its benchmark. As a result, the future of the USD LIBOR stands on shaky ground. In fact, the FCA and its panel will support its rate until 2021. Afterward, the Secured Overnight Financing Rate will replace it and the Alternative Reference Rates Committee will oversee it.